Pamper your pooch by booking them into our luxury dog friendly accommodation in St Ives, Cornwall. Located just a stones throw (or ball in this case) from Porthmeor Beach they will love having the beach on the doorstep and with the South West coastal path within easy reach there will be plenty for him to explore. > View our dog friendly properties. 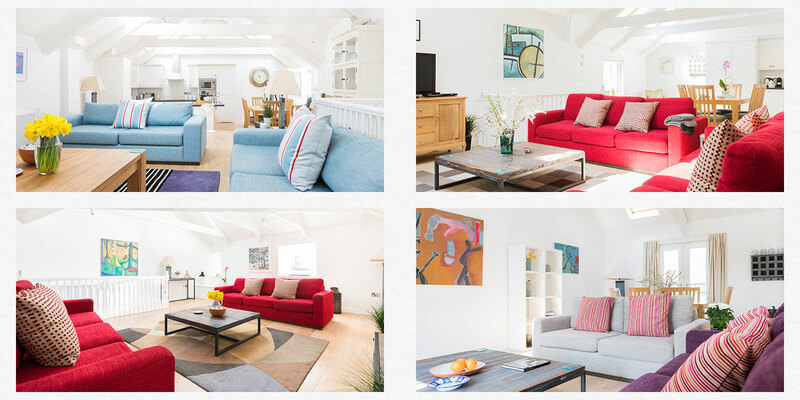 The Sail Lofts offers four dog friendly properties in St Ives, Cornwall – Harbour, Curno, Zennor and Island, and dogs are welcomed all year round. However, it is worth adding that some beaches in St Ives do restrict dogs at certain times of the year so it’s always worth checking before you arrive. We know that your four legged friend is just as much a part of the family as anyone else, that’s why your pooch is welcomed to St Ives with a dog hamper to get their holiday started. You will also find information on restaurants you can visit that are dog friendly, the nearby local beaches and more. Not only this our on-site team are at hand to help if you’re looking to discover the Cornish coast with your family. Find out more. January to March – £15 per night, per dog. April to June – £20 per night, per dog. July to August – £25 per night, per dog. September – £20 per night, per dog. October to December – £15 per night, per dog. 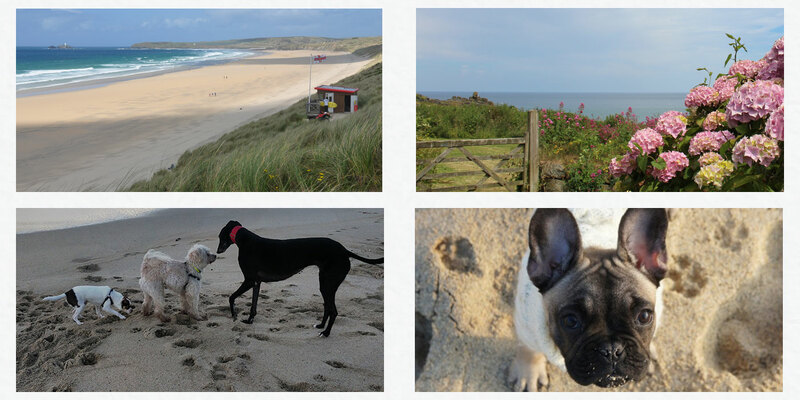 Each of our dog friendly properties are perfect to relax with your four legged friend before hitting the beach and making the most of your stay in our luxury apartments in St Ives. The team in the office at also at hand to help guide you and your four legged friends on where to go to what see or even where to eat in St Ives allowing you to take advantage of their local knowledge. Dog restrictions in St Ives operate on the beaches from the Sunday before Easter to the 30th of September. There are some beaches that are nearby, or just a short drive away that are dog friendly year round. Find out more. With so many avenues for a trek across the Cornish coastline it’s often hard to decide where to go with your four-legged friend. 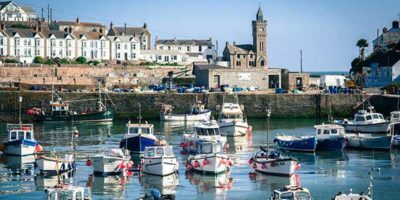 Here’s some of our top picks on where to travel the coast with your pooch while you’re in St Ives staying in our dog friendly accommodation. Find out more. One of the most inspirational walks across the Cornish headland, the road to Zennor is perfect to tire out you and your four legged friend from St Ives. The walk takes you up and down the coastal path and gives opportunity to take in some of the most incredible views of the countryside. Walking shoes are certainly recommended as the journey is without question one more rigorous journeys from St Ives. A relatively easy journey from Hayle to Godrevy this walk takes you along the Towans and the three mile stretch of beach from Hayle to Godrevy. 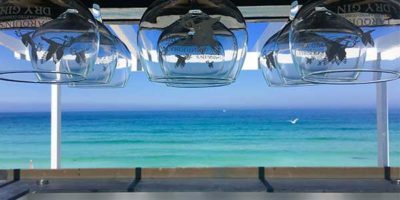 With long expansive beaches you can enjoy running across the sands overlooking St Ives Bay and head toward Godrevy Lighthouse before you head back to your luxury dog friendly apartment to relax. This short walk starts from the harbour front and weaves across the coast toward Carbis Bay, it’s not too long so is perfect to enjoy after a bite to eat in town. If you’re not feeling up for the walk back then take advantage of the train ride and enjoy the views! Just off from the edge of Marazion through the town leads you to the coastal path which winds its way towards Perranuthnoe. The walk is perfect to enjoy before heading back into Marazion and having a bite to eat at the dog friendly Godolphin Arms.